Frozen peas (l or 2 lb bags available) Defrost 15 minutes before adding to salad. Make daily individual servings or make a large bowl when company comes for a buffet lunch. It's eye catching. Pare, slice and chop cucumbers, peppers, carrots and keep in a large glass covered salad bowl in the refrigerator to make each day. 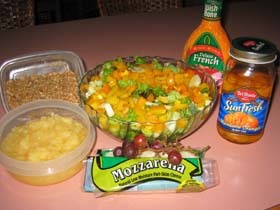 When ready to eat, add the moist quartered tomatoes, oranges and pineapple as garnish in each individual serving. Garnish each with the cheese, bacon bits and sunflower seeds. Tip: Want to know more about the person who contributed this recipe? Run your mouse over the graphic top right. Tom's Shredded Chicken Sandwich Ingredients: 2 cans (large) Swanson's chicken white meat or 2 Cans (10 oz) Hormel breast of chicken in water. 1 can Campbell's Healthy Request Mushroom Soup 3/4 sleeve saltine crackers 1 dash Worstershire Sauce Mix all ingredients together and heat on med-low heat until hot. Serve on Croissants with Romaine lettace and tomatoes. [Home] [Italian] [Oriental] [Casseroles] [Soup 'n Salads] [Spuds 'n Veges] [Roasts] [Bakery] Send comments to [Guestbook] or add your recipe: [New Recipe Form].